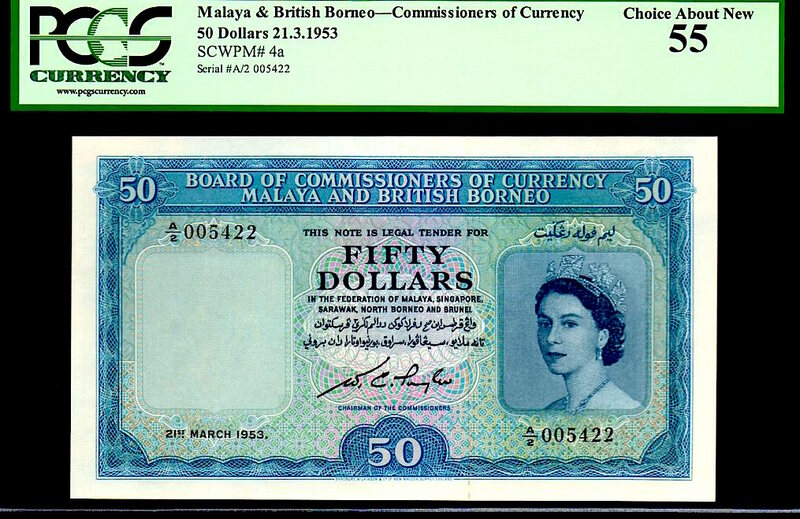 MALAYA & BRITISH BORNEO P4a 21.3.1953 $50 "QUEEN ELIZABETH II" IN PCGS 55 BUT THIS NOTE FACES UP AND HAS ALL THE APPEARANCE OF A GEM IN REGARDS TO NEAR PERFECT CENTERING, ALONG WITH RAZOR SHARP MARGINS AND GOOD, RICH COLORS! 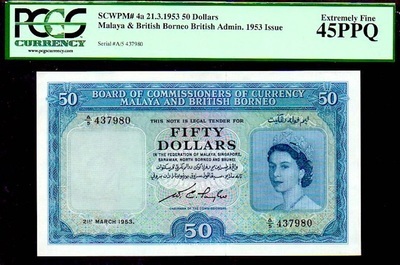 WE ALSO HAVE ANOTHER AU 55 IN A PMG HOLDER IN OUR STORE LISTED AT $2,950 SAME NOTE SAME GRADE! THIS SERIES IS SERIOUSLY IN HIGH DEMAND, VERY HIGH DEMAND! 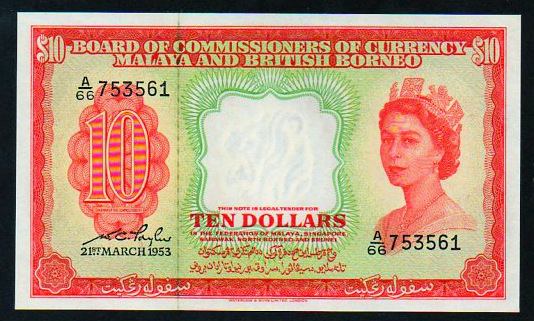 WE ALSO HAVE THE $100 IN OUR EBAY STORE! 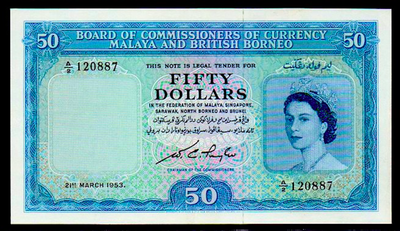 THE $50'S AND $100'S ARE RARE TO COME BY, AS WELL AS THE $5'S AND $10'S IN NICE CONDITION! HIGHLY SOUGHT AFTER SERIES! 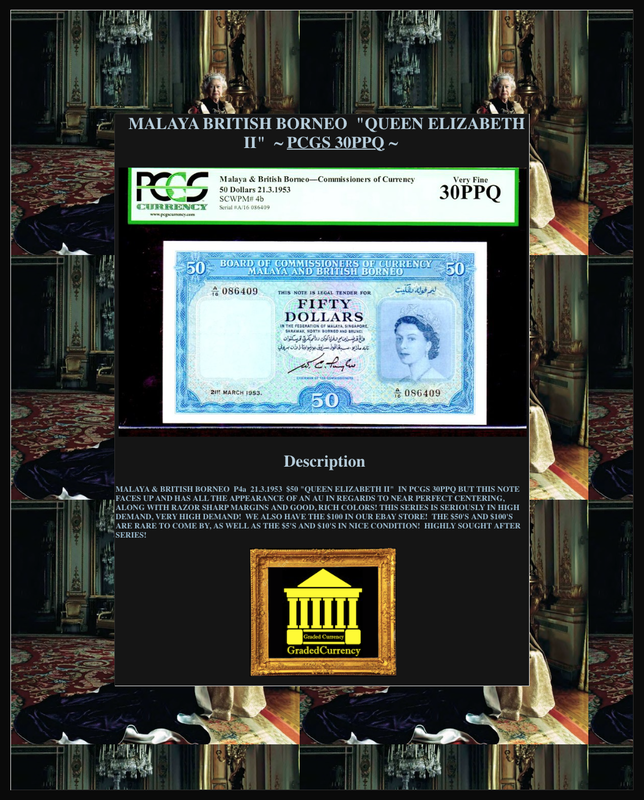 MALAYA & BRITISH BORNEO P4a 21.3.1953 $50 "QUEEN ELIZABETH II" IN CGC 45PQ THIS IS TIED FOR FINEST KNOWN CGC- IN OVER 14 YEARS!!! THIS PIECE LOOKS ABOUT AS PERFECT AS ONE COULD HOPE FOR - REGRADLESS OF GRADE! 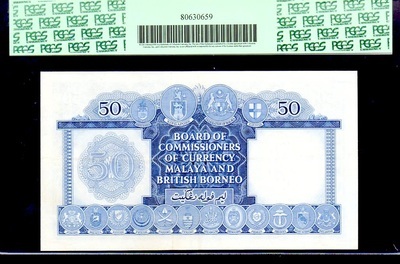 THE NOTE LOOKS UNC! THIS SERIES IS SERIOUSLY IN HIGH DEMAND, VERY HIGH DEMAND! WE ALSO HAVE THE $100 IN OUR EBAY STORE AND I BELIEVE IT HAS OVER 1,000 HITS AND 20 STRONG OFFERS - STRONG OFFERS! THE $50'S AND $100'S ARE RARE TO COME BY, AS WELL AS THE $5'S AND $10'S IN NICE CONDITION! HIGHLY SOUGHT AFTER SERIES! PICK # P4a MALAYA & BRITISH BORNEO 21.3.1953 $50 QUEEN ELIZABETH II CGC GRADED 40PQ EXTREMELY FINE! 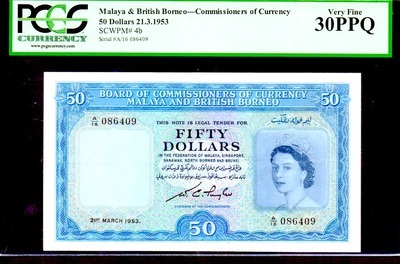 FINEST NOTE EVER GRADED BY CGC! 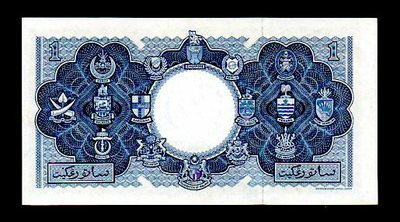 THIS NOTE LOOKS GEM IN EVERY WAY! 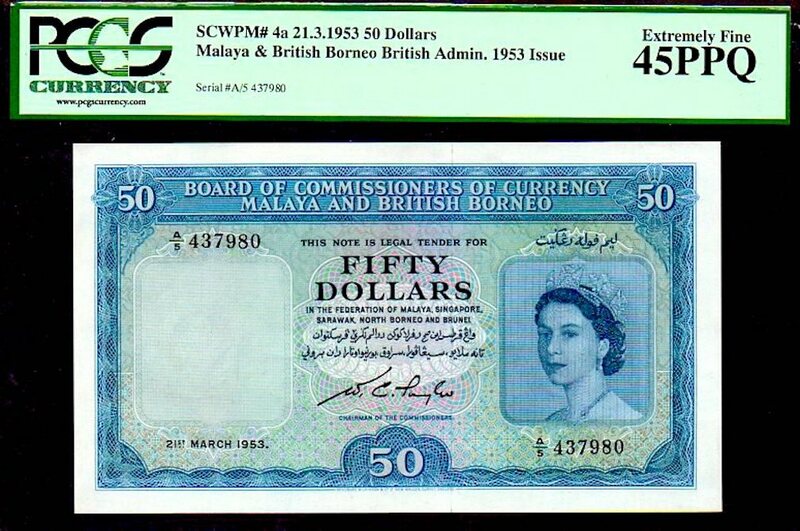 MALAYA & BRITISH BORNEO P4a 21.3.1953 $50 "QUEEN ELIZABETH II" IN PCGS 30PPQ BUT THIS NOTE FACES UP AND HAS ALL THE APPEARANCE OF AN AU IN REGARDS TO NEAR PERFECT CENTERING, ALONG WITH RAZOR SHARP MARGINS AND GOOD, RICH COLORS! THIS SERIES IS SERIOUSLY IN HIGH DEMAND, VERY HIGH DEMAND! WE ALSO HAVE THE $100 IN OUR EBAY STORE! 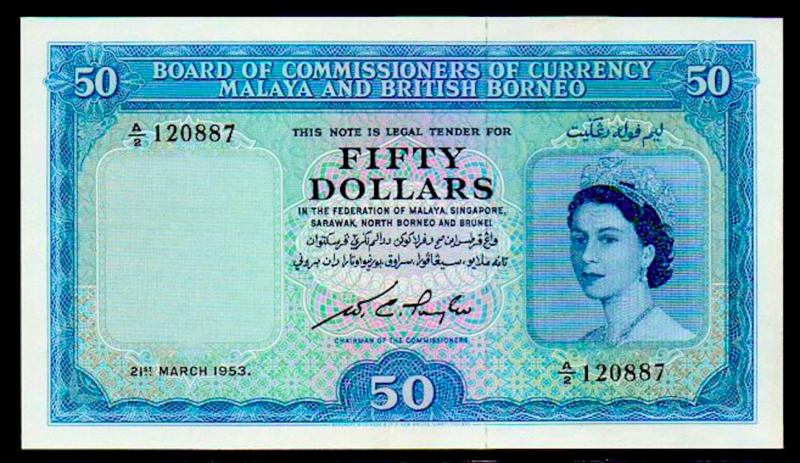 THE $50'S AND $100'S ARE RARE TO COME BY, AS WELL AS THE $5'S AND $10'S IN NICE CONDITION! HIGHLY SOUGHT AFTER SERIES! 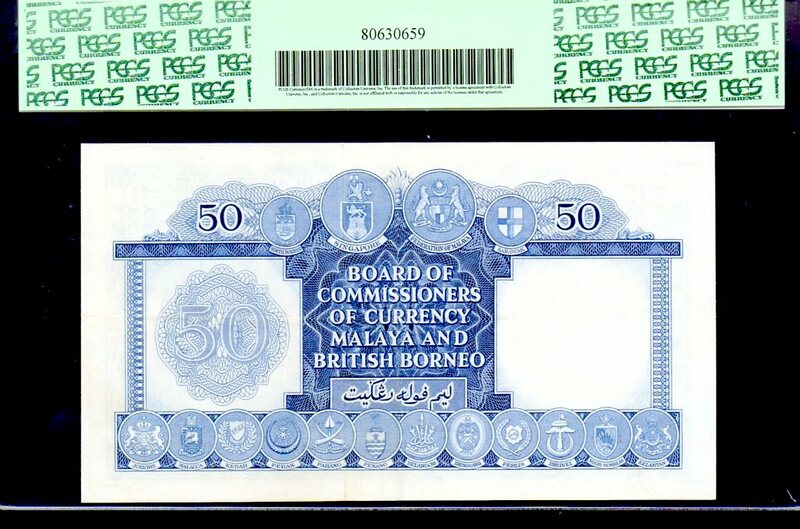 MALAYA & BRITISH BORNEO P5a 21.3.1953 PCGS 45 ~ LOOKS GEM! "FINEST KNOWN! *** 100% ORIGINAL! *** PERFECT CENTERING AND VIBRANT COLORS! 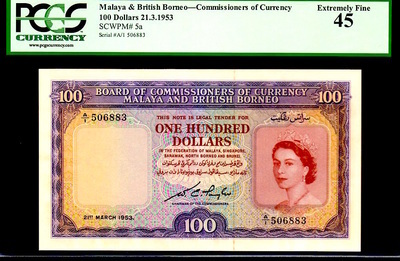 VERY VERY VERY RARELY DO YOU SEE THE $100 HIGHEST DENOMINATION EVER BEING OFFERED IN THE OPEN MARKETPLACE. 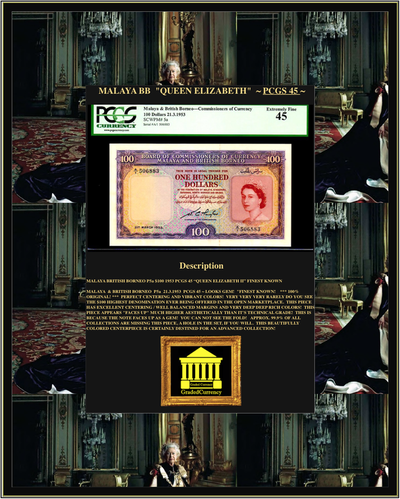 THIS PIECE HAS EXCELLENT CENTERING / WELL BALANCED MARGINS AND VERY DEEP DEEP RICH COLORS! THIS PIECE APPEARS "FACES UP" MUCH HIGHER AESTHETICALLY THAN IT'S TECHNICAL GRADE! THIS IS BECAUSE THE NOTE FACES UP AS A GEM! YOU CAN NOT SEE THE FOLD! APPROX. 99.9% OF ALL COLLECTIONS ARE MISSING THIS PIECE, A HOLE IN THE SET, IF YOU WILL. THIS BEAUTIFULLY COLORED CENTERPIECE IS CERTAINLY DESTINED FOR AN ADVANCED COLLECTION! 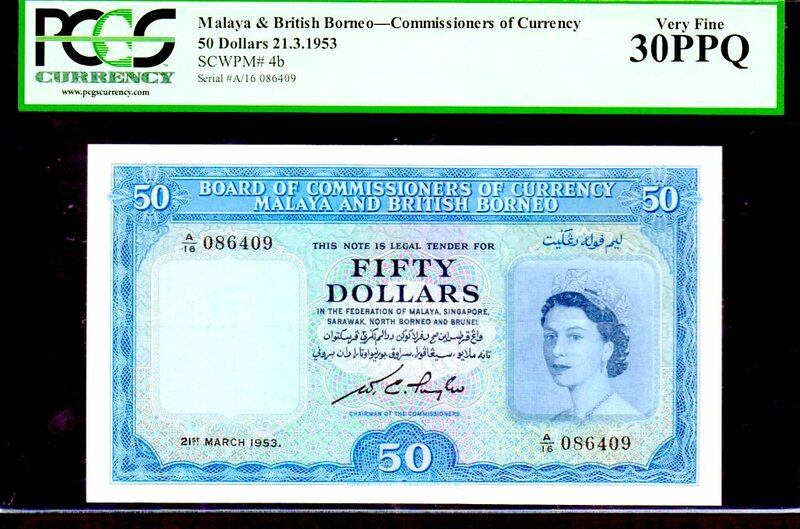 PICK # 5a MALAYA & BRITISH BORNEO $100 DATED 21.3.1953 IN CGC 35PQ! 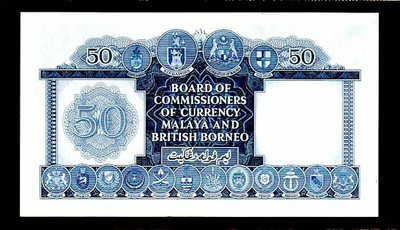 VERY VERY RARELY DO SEE THE $100 HIGHEST DENOMINATION BEING OFFERED. THIS PIECE HAS EXCELLENT CENTERING / WELL BALANCED MARGINS AND VERY PRETTY COLORS. APPEARS A MUCH HIGHER GRADE THAN IT'S TECHNICAL GRADE! ONLY ONE EVER GRADED BY CGC IN 12 YEARS OF GRADING! 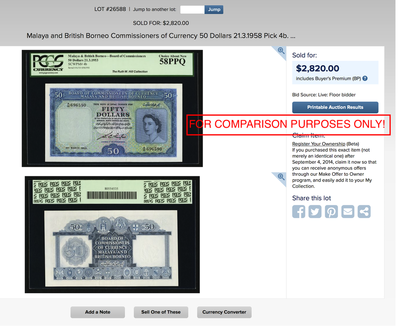 ONE OF THESE (P5a) WAS JUST SOLD IN AUCTION FOR LITTLE OVER $3,000 (IN A LOWER VF CONDITION). 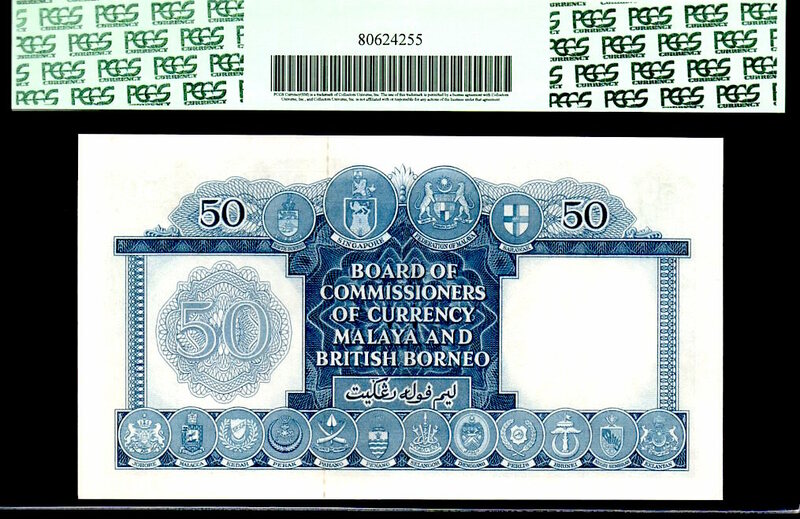 MALAYA & BRITISH BORNEO P5a 21.3.1953 CGC 35! "TIED FOR FINEST KNOWN! ONLY THE 3RD PIECE OF THIS TYPE EVER GRADED BY CGC IN OVER 14 YEARS!" *** 100% ORIGINAL! 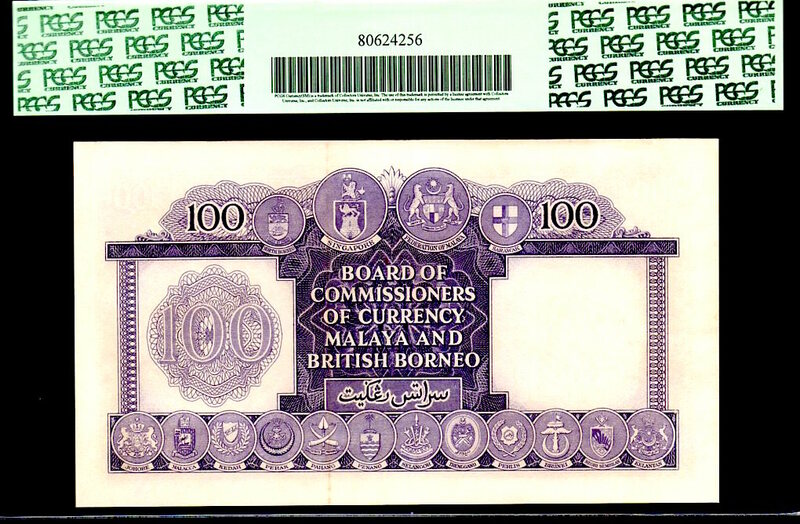 *** VERY VERY VERY RARELY DO YOU SEE THE $100 HIGHEST DENOMINATION EVER BEING OFFERED IN THE OPEN MARKETPLACE. THIS PIECE HAS EXCELLENT CENTERING / WELL BALANCED MARGINS AND VERY DEEP DEEP RICH COLORS! THIS PIECE APPEARS "FACES UP" MUCH HIGHER AESTHETICALLY THAN IT'S TECHNICAL GRADE! 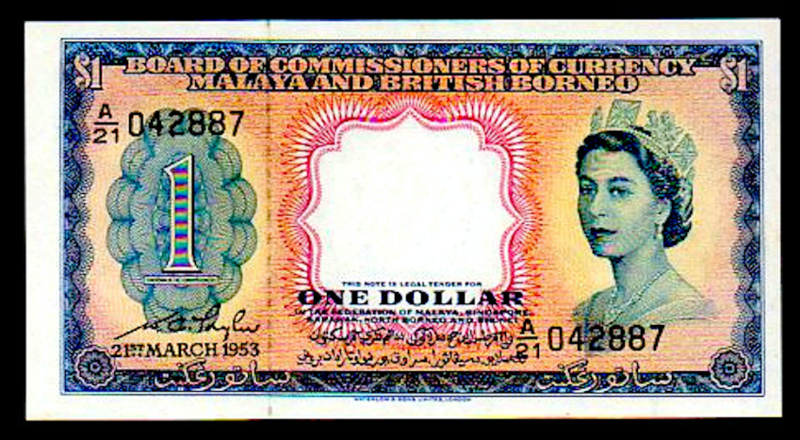 THIS IS BECAUSE THE NOTE FACES UP AS A HIGH END XF, BUT HAS A VERY VERY TINY MARGIN CUT THAT HAS BEEN PROFESSIONALLY CONSERVED. 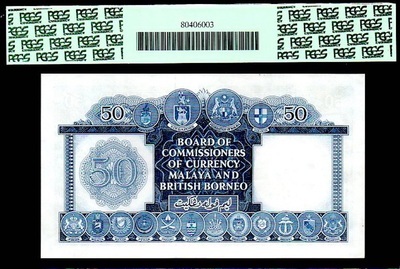 OTHERWISE THIS PIECE WOULD COST ABOUT DOUBLE IT'S OFFER PRICE. APPROX. 99.9% OF ALL COLLECTIONS ARE MISSING THIS PIECE, A HOLE IN THE SET, IF YOU WILL. THIS BEAUTIFULLY COLORED CENTERPIECE IS CERTAINLY DESTINED FOR AN ADVANCED COLLECTION! 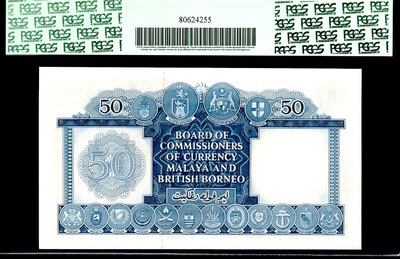 MALAYA & BRITISH BORNEO P5a 21.3.1953 CGC 30! "ONLY THE 2ND PIECE OF THIS TYPE EVER GRADED BY CGC IN OVER 14 YEARS! VERY VERY VERY RARELY DO YOU SEE THE $100 HIGHEST DENOMINATION EVER BEING OFFERED IN THE OPEN MARKETPLACE. THIS PIECE HAS EXCELLENT CENTERING / WELL BALANCED MARGINS AND VERY DEEP DEEP RICH COLORS! THIS PIECE APPEARS "FACES UP" MUCH HIGHER AESTHETICALLY THAN IT'S TECHNICAL GRADE! 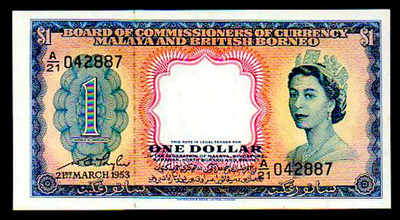 THIS IS BECAUSE THE NOTE FACES UP AS A HIGH END XF, BUT HAS A VERY VERY TINY MARGIN CUT THAT HAS BEEN PROFESSIONALLY CONSERVED. OTHERWISE THIS PIECE WOULD COST ABOUT DOUBLE IT'S OFFER PRICE. APPROX. 99.9% OF ALL COLLECTIONS ARE MISSING THIS PIECE, A HOLE IN THE SET, IF YOU WILL. THIS BEAUTIFULLY COLORED CENTERPIECE IS CERTAINLY DESTINED FOR AN ADVANCED COLLECTION!